Subtitle: As the Senate approves funds to build a missile defense system, the fact is that we already have one in place, utilizing technology quite different than the system being publicized. NEWS BRIEF: "Senate OK's antimissile defense plan: Foreign testing spurs action", by Anne E. Kornblut, Globe Staff, The Boston globe, Thursday, March 18, 1999, p. A-1, 26. WASHINGTON -- "Reacting to warnings that missiles from several emerging nations could soon be capable of hitting the United States, the Senate voted yesterday to build a national defense system as soon as the technology is developed, overcoming earlier opposition from Democrats and the White House. The national missile defense bill said little about how that system would work, how much it would cost, or when it would be ready. But it cemented the Senate's commitment to defend against missile attacks, raising the profile of a plan that has been discussed in various forms since 1983." "The legislation, which the Senate approved 97-3, follows several unexpected missile launches by foreign nations, including a long-range ballistic missile tested by North Korea last August, and medium-range tests by Iran. The fear is that those nations will soon have the capacity to fire rockets to the United States." This specter of so many Liberal Democrats joining Republicans in voting for this antimissile defense system is the first thing that should raise a very huge red flag . Liberal Democrats have always rejected the very fundamentally sound idea of a missile defense system, so why should they suddenly vote for one now? "We can't offend the Russians", they said. "We will cause Russia to attack before we can get the system in place", they said. "We will be causing a new arms race", they said. Liberals raised every kind of dumb argument you can possibly conceive against the rational idea of defending yourself. I felt the hair raise up at the back of my head, I was so upset. These Liberals argued so strenuously against Reagan's common sense idea of missile defense that I wondered to myself if they were not secretly in Russian employ. Now, at this time in our history, when they have one of their own Liberals in the White House, Liberals on both sides of the aisle overwhelmingly joined Conservatives to pass a bill, 97-3, to build a national missile defense, even though their own Liberal in the White House is opposed to it! Something just does not compute here. Stay with us a little bit so we can show you just why this most definitely does not compute and what is truly going on. Let us continue for a moment with our news story. "Senator Jack Reed, Democrat of Rhode Island, said there was a 'real, substantive reason' to bring the system to the top of the list of foreign policy concerns, citing tests by Iran and North Korea as reasons 'this has become a front-burner issue'." It is quite a spectacle when the extremely Liberal Jack Reed, of anti-Defense Budget fame, backs an expensive and controversial Defense program! What in blazes is going on here, Batman? We have now established that the Congress is almost unanimously united in voting for the kind of funding necessary to establish a working antimissile defense system. Which kind do they propose to build? This part of the story tells us exactly what kind of missile defense system Congress intends to fund. "The system, which remains largely undeveloped, uses a combination of sensors, trackers, and a defense missile to monitor the location of enemy missiles and shoot them down. Analysts say it is analogous to 'hitting a bullet with a bullet', and is equally difficult, part of the reason the program so far has made little progress." Therefore, Congress is going to resurrect an antimissile defense system that has been made proven unworkable, even after more than a decade of intense scientific research and development, and the funding of over $40 billion. Why would Congress almost unanimously do something so silly? Other politicians have suggested that, perhaps, Congress just wanted to seem like they are 'doing something' to defend this country against 'rogue states', while not doing anything in reality. While I believe this scenario certainly has merit, I do believe Congress is acting in accordance with another reality. While in Army Intelligence, I learned a few things about how the Government handles technological matters. I learned that, when the Government announces it is going to start working on a new, critically-important weapon, you can just about assuredly conclude that they already have perfected the technology, and have been keeping it silent for years, sometimes for decades. You see, when the Government announces publicly that it is going to start working on something, it has just admitted that such a technological phenomenon is feasible, and that they possess some of the technology already that would make the new weapon work. Thus, the Government generally will not admit that it is even beginning to work on a weapon until it already has it in place. This extreme desire for secrecy is the reason the Government has a very secret "Black Budget" in place, so that no one knows how much money is being spent on anything. Neither the budget nor the specific area of development are ever, ever divulged. 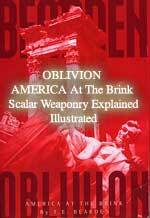 Once the technology is developed, and the weapon is secretly in place, then the Government can admit that its scientists are "working on" the technology to develop the new weapons system. You can laugh at any and all protests from environmental groups and other activists as they try to stop something that is already in place . Thus, we can conclude that, maybe, just maybe, the United States has a workable antimissile defense system already in place, enabling members of Congress to almost unanimously vote to fund such a system. While I am positive this is the case, I am puzzled that Congress says it is going to spend money on a system that is proven impossible to develop, and a system that has been abandoned. What I believe is happening here is that members of Congress, working hand in hand with the White House, are trying to play the old shell game with us, trying to get us to look in one direction while the true system is in the other direction. What kind of system might we already have in place? We have HAARP, the extremely low frequency radio transmission system. HAARP can destroy 100% of missiles coming in, because it can effect dramatic changes in the atmosphere in which the missiles are flying, and it can bombard the missiles with deadly radio waves that will destroy the computers on board directing the missiles to target. These radio waves are so powerful that vital missile systems cannot be hardened sufficiently to keep them from being destroyed. But, even if the vital computer guidance systems on board a missile survived the HAARP bombardment, the missiles would be destroyed in another way. HAARP is also known as an "Ionospheric Heater", simply because it quickly heats the atmosphere once the radio transmitters are turned on. Thus, as soon as a missile launch is detected, HAARP radio transmitters would begin to heat the atmosphere in the path on which the missiles are incoming. Immediately, the atmosphere would begin to heat, causing the thin air in which the missiles are going to travel to be much thicker than the computers on board the missiles have been programmed to expect. Thus, the missiles would begin their downward descent much more quickly than they should, exploding far off course, and far away from their targets. As we have studied about the HAARP extremely low frequency weaponry, we know that America and Russia have the capability to destroy and/or deflect all incoming missiles. 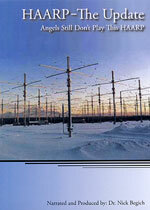 If you have not read the basic information on the capabilities of HAARP technology, we encourage you to read NEWS1207, "A Terrifying Look At Weather Warfare -- A Look At HAARP ". Then, you will better understand the importance of this particular news article. Jerry Smith, author, "HAARP: Ultimate Weapon of the Conspiracy", wrote an email to The Cutting Edge Ministries on 12/16/98. Jerry was specifically answering my question as to whether HAARP technology could be used to annihilate man, woman, and child in a specific target area, like Israel. Jerry replied that, yes, HAARP radio waves could annihilate 100% of all mammal life within a targeted area, doing so in a matter of a few minutes. But, then, Jerry added one more bit of information, that I believe applies to this situation very strongly. 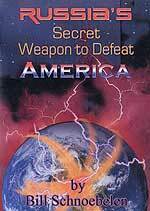 Jerry said that HAARP weapons had been used in the Gulf War of 1991 [8 long years ago], and would probably be used again very soon. You see, such technology of killing with radio waves, and of destroying enemy missiles with radio waves, has been greatly enhanced since 1991. Now, such technology is based upon very mobile trucks, on ships at sea, and probably, on high-flying aircraft, like our flying radar airplanes otherwise known as AWAC's. Thus, America can be blanketed with this highly efficient missile defense system. This system is so effective it just might have rendered missiles obsolete! We find it highly instructive that the great Arms Reduction progress with the Russians began to be realized on missile and missile warhead reductions, only after this HAARP technology had been perfected, and was in place. Further, missiles becoming obsolete is one of the major reasons President Clinton, and his White House advisors, are not losing any sleep over the loss of nuclear military secrets from our defense laboratories because of Chinese espionage. This is the same reason President Clinton did not feel that he was jeopardizing American security by allowing China to buy sophisticated missile guidance technology from American companies. In Clinton's mind, he is getting good, hard cash for selling technology to the Chinese that we have already rendered obsolete by HAARP ! So, we can see that President Clinton and the Congress are playing a game with us by pretending to fund a system they never intend to build. Indeed, $40 billion worth of research and development has conclusively demonstrated that you cannot hit a missile with another missile. This fact is one of the major reasons the Pentagon so aggressively pursued HAARP technology. Once again, we see Congress cooperating with the White House to deceive us. Once again, we see both Democrats and Republicans cooperating to deceive us. Once again, we see that members of both parties cooperating to deceive us. Truly, Jesus Christ was right on the money when He prophesied that the Hallmark characteristic of the End of the Age was going to be deception. This deception will reach its highest expression during the reign of Antichrist, becoming so good that everyone on earth will be deceived, except the Elect, who will be enlightened by the Holy Spirit. Today, Democrats generally and President Clinton specifically, have learned the art of deception very, very well. Today, the American people are being deceived to the highest degree ever realized in our country's history, on so many issues both domestic and foreign. This gambit over Congress supposedly funding a system of missile defense that is proven unworkable is just another deception ploy. Why are they deceiving us in this way? They are trying to attract public attention toward the false system supposedly being developed, and away from growing public awareness of the existence of HAARP technology. You see, they have every reason to want to keep HAARP under wraps, because they are fearful of the public outcry which might occur if the American people ever understand that this system can also be used to bombard our minds so we cannot think on our own. But, that is the subject of another series of planned articles. Congress and the President are cooperating on this issue to deceive us, to get us to looking in the wrong direction regarding missile defense. But, at least you know why Liberal members of Congress were able to join Conservative members in voting for this so-called missile defense by the overwhelming margin of 97-3. Now, you are deceived no longer on this issue. Truly, the level of deception we are seeing is so great, so pervasive, and so effective, we can see that it portends the End of the Age. Are you spiritually ready? Is your family? Are you adequately protecting your loved ones? This is the reason for this ministry, to enable you to first understand the peril facing you, and then help you develop strategies to warn and protect your loved ones. Once you have been thoroughly trained, you can also use your knowledge as a means to open the door of discussion with an unsaved person. I have been able to use it many times, and have seen people come to Jesus Christ as a result. These perilous times are also a time when we can reach many souls for Jesus Christ, making an eternal difference.